Before learning how to draw a bird: some fun facts before starting sketching! A blue jay will be very aggressive when it's time to defend its territory. They will eat about anything including insects and eggs. The light refraction on the feathers will create the blue color. You want to learn how to draw a cartoon bird? Why not try a blue jay. These splendid animals have a blue crest on the head (1). 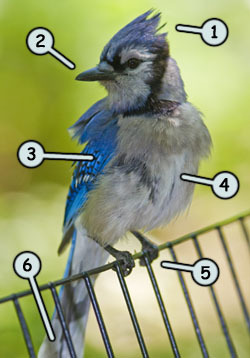 Most of the plumage is white, like the face and the body (4), but the top of the tail (6) and the wings (3) are blue. Notice how the head is collared with a long black line. The beak (2) is black and not very long. Like most birds, they have tiny delicate feet (5), black in the case of the blue jay. If we take a look at the shapes that form the blue jay, we can see that most of them are triangles and circles. I think that the use of triangles are important to draw this bird efficiently. So in order to draw a very recognizable blue jay, we should put more emphasis on his crest on the head, the black lines on his head and of course, put a little blue now and there. 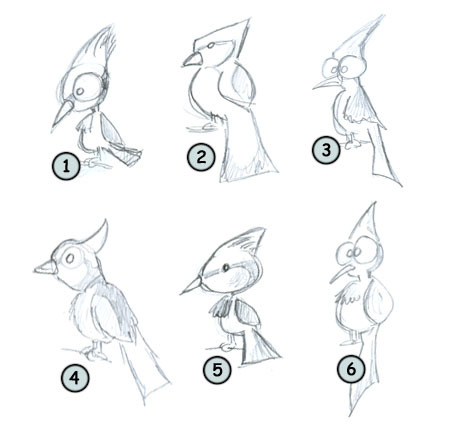 Follow the simple steps below to start drawing your first blue jay. Look at the first two steps and pay attention to the crest and the tail. They are not made with circles, but with triangles and rough shapes. Even in step 3, we can now assume that this bird is not your typical pigeon. As you progress, go into fine details like the black line of the head and the black spot and the tail.